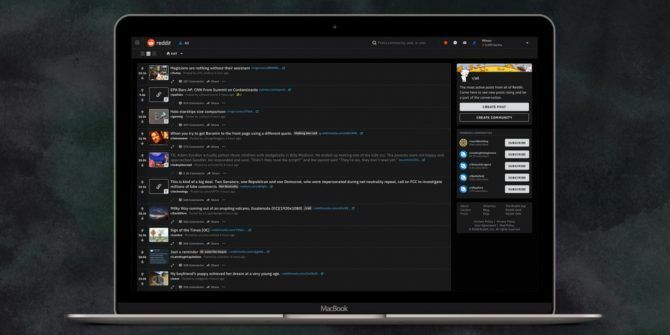 Reddit has added a native Night Mode to its desktop site for the first time. A Night Mode was previously available on desktop via the Reddit Enhancement Suite, and is also available on Reddit’s mobile apps, but it’s now available natively. In April 2018, Reddit started rolling out a new redesign The New Reddit Redesign Is Rolling Out Now The New Reddit Redesign Is Rolling Out Now Reddit has started rolling out its redesign, the first the site has undertaken in years. Which should be good for attracting newcomers, but may upset longtime users. Read More , its first in a decade. Reaction to the redesign has been mixed so far, but regardless of their opinions, plenty of Reddit users requested a Night Mode. And the Reddit Design team have now delivered. On the Reddit Blog, Reddit explains how it took notice of the demand for a Night Mode. So, the Design team unified the colors used across the site, set up support for multiple color schemes, and made sure the experience was consistent across platforms. Reddit employees have been testing the new Night Mode for a few weeks, with admins squashing bugs as they reared their ugly heads. And now, Reddit has flicked the switch, allowing ordinary users like you and me to browse the Reddit website in Night Mode. Turning Night Mode on is really very simple. If you’re viewing the designed homepage just click on your username in the top right-hand corner, scroll down to “Night Mode,” and toggle the button across. The colors will switch, helping you read in the dark. If you haven’t yet switched over to using the redesigned Reddit, you’ll have to do so before you can use Night Mode. So, go to your Settings, scroll down to “Beta Options,” and check the box for “use the redesign as my default experience”. Night Mode is a minor upgrade in the big scheme of things, but for those of us who browse Reddit late at night after finishing all of our actual work, it could be a Godsend. And science backs up the claims that dark backgrounds can help you sleep. If you haven’t visited Reddit since the changes started rolling out, we have already produced a quick guide to the Reddit redesign A Quick Guide to the New Reddit Redesign A Quick Guide to the New Reddit Redesign Reddit was long overdue a redesign. However, if you're feeling a bit lost in the new Reddit, don't worry, as we're here to help you navigate the new Reddit redesign. Read More . So before you decide you hate it and want everything to revert back to the way it was, have a proper look at what’s different. Explore more about: Night Mode, Reddit.